After continuing our journey with John Crichton last week with “The Hidden Memory” and “Bone to Be Wild,” our Farscape re-watch continues this week with the final episode of Season 1. 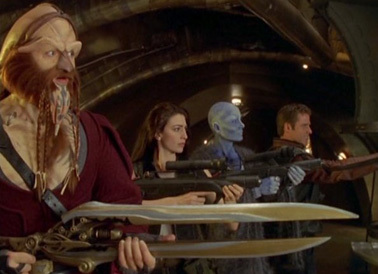 Farscape‘s magnificent first season finale is actually the most difficult episode to write about so far, and that’s because there is just so much that happens in it, and interestingly, most of that “so much” isn’t driven by plot but by character. In some ways, the episode could be seen as a series of character scenes, many of them goodbyes between characters who we have grown to love and who have grown to love each other. In their DVD commentary, series creators Rockne S. O’Bannon and David Kemper discuss how, by all rights, this shouldn’t have worked as a compelling, cohesive episode, and yet the various relationships are so strong, the writing, acting, and directing so assured that it flows beautifully. In his commentary with Claudia Black, Ben Browder discusses the episode’s “lyrical quality”. Never do we as viewers begrudge a single moment of screentime, because in many ways, it is a love letter to every single one of these wonderful, strange, flawed people who make up this unique space opera. At the same time, major plot developments occur as well, including a series of jawdropping cliffhangers so mindfrelling that, the first time around, you honestly have no clue how the story will possibly be able to proceed from this point on, setting up a Farscape tradition of practically burning the show to the ground with each season finale and picking up the pieces in entirely unexpected, innovative ways the next year. But, as I was saying, what this also adds up to is an episode that is remarkably difficult to break down for analysis. Every character moment, every narrative decision is so superbly handled that my impulse is to just post a transcript of the entire episode, for fear of leaving anything out. Also, since it is effectively a collection of vignettes between characters, it makes it more difficult than usual to dig into the episode in anything resembling coherent structure. There’s so much to unravel, I’m not even sure where to begin, so in lieu of my usual format, I’m going to be handling this review in list form, which I think will be the simplest solution to navigating this remarkable hour of television. 1) Farscape‘s first season finale begins with one of the main crew attempting to sell all of the others out in order to secure his own freedom. Three guesses as to who! Seriously, though, right from the get-go, even what is arguably one of the series’ most relatively (for lack of a better, less reductive word) sentimental episodes opens up with Rygel stabbing the rest of his newfound family in the back, going to Scorpius to attempt to broker a deal, a great reiteration of Farscape‘s modus operandi, just in case we might have been worried that our beloved Dominar might have been going soft. It could be easy for any of these reviews to devolve into a simple list of things that “most other shows wouldn’t do,” but certainly, this sort of action is a rarity for a character, particularly this late in the game, once the team has bonded so closely. And perhaps even more so because of how uncompromisingly his betrayal is portrayed. Although he may feel some unexpressed internal conflict about what he’s doing (he certainly has a conscience, but he’s very good at ignoring it), he doesn’t change his course due to a change of heart but because Crais makes it clear to him that Scorpius is planning on executing him after Crichton is captured. Rygel goes back to Moya, with Crais in tow, in order to save his own hide. And as much as Rygel has come to love the others aboard Moya (though would never admit it), none of this feels at all a stretch for him. He’s a very pragmatic character, and given the untenable conditions and tension they have been living under since fleeing the Gammak Base, it’s entirely believable that he’d give into his worse instincts. JOHN: (interrupting) Do what? Do the right thing? JOHN: Rygel, I figure the right thing starts at the beginning of the day. Not after you’ve been caught. At which point Rygel genuinely hangs his head in shame, and John, seeing that gesture, chooses to forgive him, giving him a kiss on the forehead to which Rygel, nearly on the verge of tears, says, “Thank you”–Jonathan Hardy’s delivery of the line absolutely destroys me every time I see it–until finally saving face by continuing “…for the possessions,” namely the ones John told him he could have should he not survive the mission. It’s such a stunningly beautiful moment because it’s so simple. Crichton doesn’t hold a grudge against him forever, because in large part, he understands Rygel, and he also senses his sorrow for his actions. Even after all he’s been through, John likes to believe the best of people, including Rygel, and his forgiveness is a sign of his not being a bitter person. He does demand that Rygel really think about what he did but having done so, moves on, particularly knowing this could be goodbye. At the same time, Rygel manages to acknowledge his feelings for him while also retaining his innate Rygelness. It’s just exquisite writing, acting, and directing. It is obvious sohbetsoft the site’s beauty .